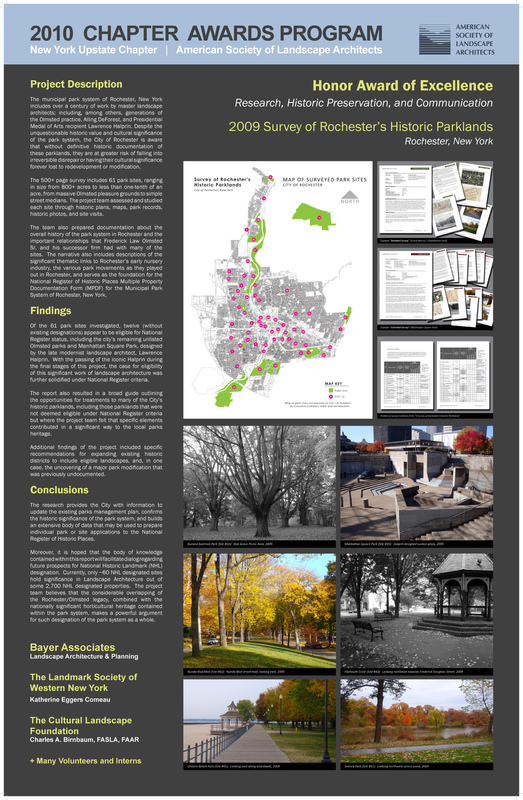 For our work on the 2009 Rochester Historic Parks Survey, Bayer Landscape Architecture has received the 2010 Honor Award of Excellence in Research, Historic Preservation & Communication from the New York Upstate chapter of the American Society of Landscape Architects (ASLA). The project team included The Landmark Society of Western New York (Katie Eggers Comeau) and Charles A. Birnbaum from The Cultural Landscape Foundation. The historic parks survey includes 61 park sites, ranging in size from 800+ acres to less than one-tenth of an acre, from massive Olmsted pleasure grounds to simple street medians. Led by the landscape architect, the project team assessed and studied each site through historic plans, maps, park records, historic photos, and site visits. The team also prepared documentation about the overall history of the park system in Rochester and the important relationships that Frederick Law Olmsted Sr. and his successor firm had with many of the sites. 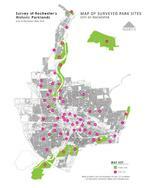 The narrative also includes descriptions of the significant thematic links to Rochester’s early nursery industry, the various park movements as they played out in Rochester, and serves as the foundation for the National Register of Historic Places Multiple Property Documentation Form (MPDF) for the Municipal Park System of Rochester, New York. The research provides the City with information to update the existing parks management plan, confirms the historic significance of the park system, and builds an extensive body of data that may be used to prepare individual park or site applications to the National Register of Historic Places.